Today, mental health professionals are seeing record numbers of people suffering from substance abuse, anxiety, depression, PTSD, child trauma, risk for suicide, and countless other mental illnesses. LESS THAN HALF OF AMERICANS WITH A MENTAL ILLNESS GET PROFESSIONAL TREATMENT. Unfortunately, not everyone receives the professional care they need, even though most conditions can be treated successfully. The key is early intervention. Of course, it is also widely suggested that the patient start the conversation with their doctor. When you get treated for the flu or some other physical concern, your physician will naturally focus on the issue at hand. They may or may not see the signs of stress, anxiety, or other issues you’ve also been suffering from in your daily life. It’s often up to you to ask questions as to whether or not you might benefit from a conversation with a mental health professional. It’s not uncommon for a patient to ask, “One other thing … I’ve been feeling a lot of anxiety lately. Is that a concern?” Your physician should take that as a cue to ask more questions and get to the heart of the problem. 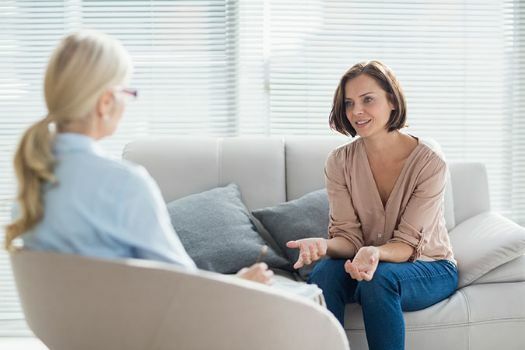 Dr. Leonhardt and other mental health professionals also emphasize that while treatment is easy to access, far too many people are never diagnosed. A FIVE-MINUTE CONVERSATION CAN SAVE A LIFE. According to a recent survey by the Substance Abuse and Mental Health Services Administration, only half of all Americans who experience a mental illness actually receive mental health care. * This puts millions of Americans at risk for potentially severe consequences, including suicide. That’s why mental health professionals like those at PORT Health welcome your questions and concerns about mental well-being. There have been far too many cases where a five-minute conversation at an early stage could have not only changed a life, but perhaps also saved one. It’s also important to remember that you not only need to look in the mirror, but also watch out for other members of your family. Now more than ever, we’re all being subjected to more stress than any time in history. The intense impact of today’s fast-paced, high-pressure world is taking a toll on each of us. Are you having more frequent arguments with your spouse? Have you noticed any changes in behavior by your children? Could another member of your family be showing signs of going through a difficult time? In today’s world, it is far safer to have a simple, caring five-minute conversation than to simply assume all is well. The life you save may be a loved one closer than you imagine. If you observe signs of any mental illness in a loved one or experience symptoms yourself, contact your primary care physician or a mental health professional such as PORT Health at 252-830-7540.